Aluminum foil can be found in almost every kitchen across America, and yet there are LOTS of uses for aluminum foil most people aren’t aware of. These aren’t just your average kitchen uses either – each of the uses for aluminum foil I’m about to describe could easily help save your life in a survival situation. Aluminum foil provides a shiny, reflective surface which can use the sun’s rays to alert rescue teams of your position. 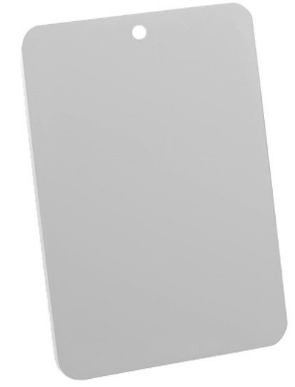 This impromptu signal mirror could easily save your life if you’re lost. 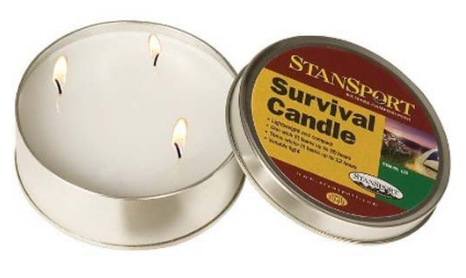 If you’re holding an emergency candle, it’s imperative you don’t burn yourself with the hot wax. Eliminate this issue with aluminum foil; layer a few pieces on top of each other so it’s thick, and form the foil into a bowl shape. Then cut a hole in the middle of the bowl, and push your emergency candle through it. Light the candle, and never worry about burning your skin again! Char cloth can seriously come in handy in an SHTF situation; this flammable material can ignite in a single spark, allowing you to warm your hands, cook survival food, AND see in the dark in seconds flat. Watch this video to see how you can make char cloth out of aluminum foil. If you’ve got a bunch of small survival tools you need to get out of the rain, you can wrap them in a piece of aluminum foil. This is especially effective for matches, as you can’t afford them to become soaked and ineffective. Now keep in mind doing this won’t make your survival gear waterproof (so don’t go swimming with it) but the aluminum foil will definitely help keep your gear dry. 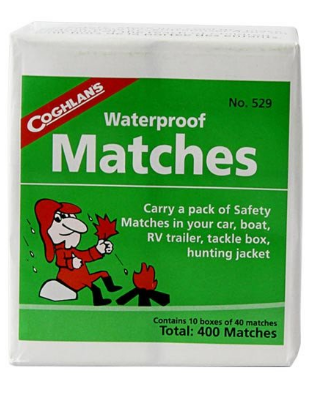 Note: If you want to ensure your matches are ALWAYS highly effective (even in the pouring rain), you’ll need our waterproof matches below. Aluminum foil’ s reflective qualities make it an eye-catcher for fish in the stream. Hook them quickly by adding a small piece of aluminum foil to your hook or weight. 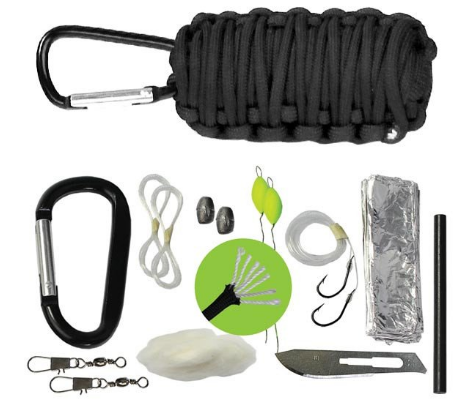 Note: We’ve got a piece of aluminum foil (as well as 14 other life-saving fishing/survival supplies inside our incredibly compact Paracord Grenade. Check it out! Stuck-on grease and char from your camping/bug out cookouts can be annoying, especially when the contents rub off onto the rest of the gear in your pack. Clean up your pots and pans by scrubbing them with a piece of aluminum foil. However, Be sure to NOT scrub the foil on teflon, as it will scratch the pan’s surface and remove its non-stick properties. Note: If you need some excellent extra bug-out/camping/everyday cookware, our Hard Anodized Aluminum Cookware set gets the job done right. Check it out below. There’s few things scarier (or more dangerous) than being lost in the woods for days on end. Get rescued quicker by wrapping strands of aluminum foil around trees and branches. 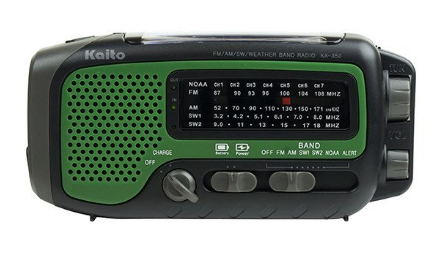 These will help signal rescue teams that they’re on the right path to saving you. Using a few layers of foil you can easily design your own plates and bowls to eat your survival food with. Simply layer the pieces on top of each other, then turn up the edges and fold them over each other. In minutes you’ll be ready to eat. If you’ve got a really dull pair of scissors, you can sharpen the blades by rubbing a thick piece of aluminum foil against each side for about two minutes. Afterward, your scissors should cut even the most stubborn materials with ease! You can also sharpen other blades (such as from your survival knife) with aluminum foil; however, you’ll have to use a very thick piece of it and be very careful not to cut yourself. Want to find out which survival knife is the best for your next bug out trip? Discover the info here. Transferring a hot coal to a new location can be tricky; however, you can let aluminum foil do all the work. First, take a piece of aluminum foil and fill it with shredded bark from a cedar or juniper tree. Then take the hot coal and lay it onto the bark, and roll the foil around it in the same way you would roll a cigar. Leave one of the ends open to let the air in, and you’ve got a safe way to transport a hot coal that won’t burn your hands. Before you lay down for the night, lay a large piece of aluminum foil on the ground first, below your sleeping bag. Doing this will help prevent the water on the ground from seeping into your sleeping bag. 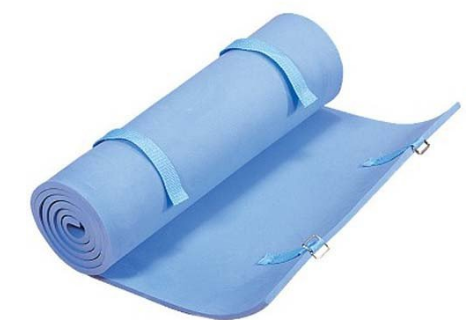 Note: If you run out of aluminum foil, our Portable Foam Camping Pad does the same job (and is way comfier to sleep on!). See it below. If you’re using the old cotton ball and petroleum jelly combo to start a fire, you can use aluminum foil to greatly extend the life of that fire starter. Simply lay the jelly-soaked cotton ball on a piece of aluminum foil, and then light to enjoy your fire for longer. By using your aluminum foil as a fire screen, you can radiate more warmth back to you, as well block the wind AND hide the fire’s light from observers. If you don’t want your fire to be seen, this is a great way to help keep your location hidden from the enemy! To protect your fruit trees’ bark from being nibbled on by critters, simply lay aluminum foil around the base of the tree. Deer and other animals will sniff it and move on. 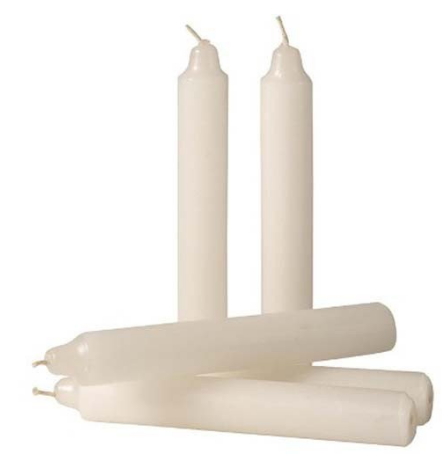 Take a large piece of aluminum foil and fold it so it’s standing up; then place an emergency candle in front of it. When the candle is lit, the light from the fire will bounce off the foil and amplify it, giving you more light than you’d have with the candle alone. By moving or folding the foil, you can also help direct the light into a certain direction. 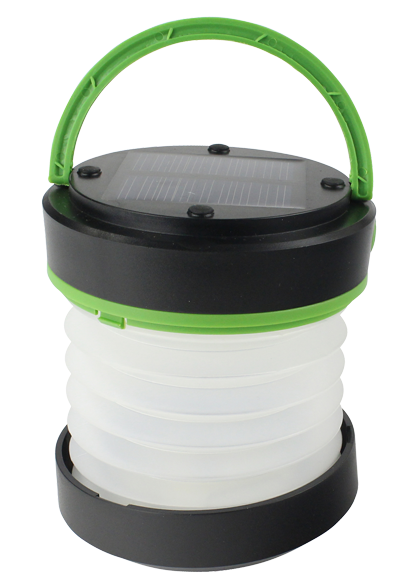 This can help shine light into a dark spot, or help you get rescued faster. By using aluminum foil and a little bit of time and energy, you can transform an ordinary piece of aluminum foil into a cup to boil water in. 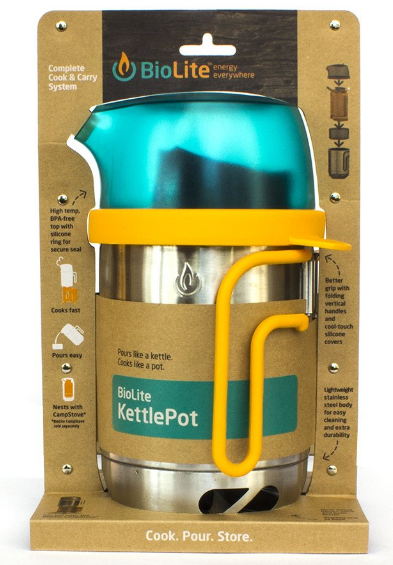 Note: If you don’t want to go through the hassle of making a flimsy cup out of aluminum foil, we HIGHLY recommend using our amazing BioLite KettlePot for all of your boiling and pouring needs. Check it out! 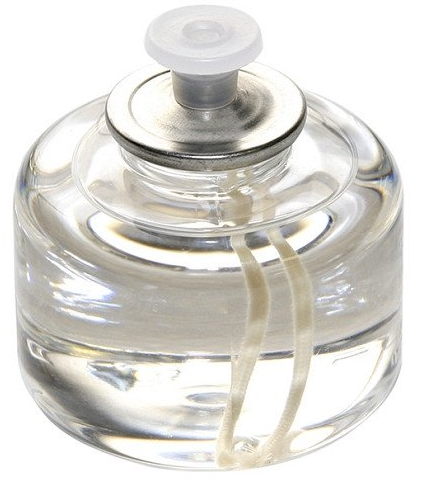 If you’re trying to get dirt, sand, or other loose items into a container (or if you’re trying to transfer liquids), a funnel makes it a lot easier. You can easily fashion one out of aluminum foil. Plus, the great thing is this process allows you to fashion it into any size funnel you want for a variety of circumstances. Whether it’s pots/pans, a milk jug, or any other device, you can use aluminum foil to cover almost any container; this will help secure the contents from spilling out all over the ground. However, don’t cover tomatoes with aluminum foil, as the acid will erode a hole through the lid. If you’re bugging in, you can use aluminum foil to insulate the windows in your home; this will help keep the heat in during the winter time. You can also line aluminum foil along the inside of your tent to help insulate it if you’re camping or bugging out. If you find a long stick with two branches forming a Y at the end, you can make yourself a DIY frying pan. 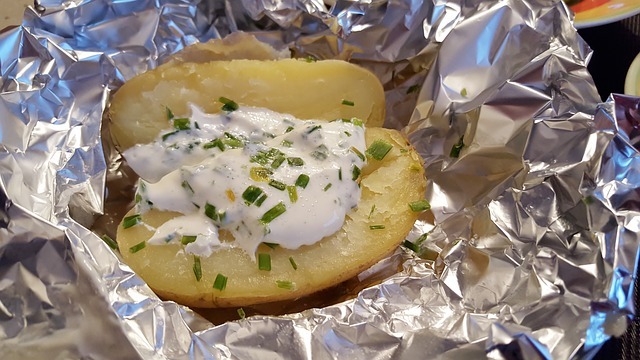 Wrap aluminum foil tightly around the Y shape, and then place the survival food you want to cook (i.e: potatoes, meats, etc.) on top of the foil. Tip: Be sure that the stick is long enough that you can hold it without having your hands in the fire. Rust can quickly corrode your survival tools; however, with the use of aluminum foil, you can remove those spots quickly and easily. Simply take a piece of foil and rub it back and forth over the spot, applying pressure. 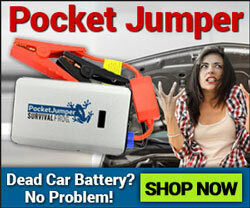 This will remove those nasty rust stains and make your survival tools look as good as new. Using aluminum foil and a few other simple tools, you can build and use your very own solar oven! 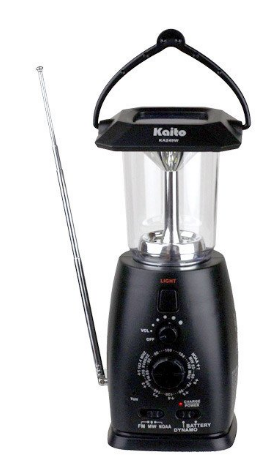 This incredible device will cook your survival food for you, and requires no fire – just the sun’s rays – to get the job done! Check out how this simple yet effective process is done here. Or, you can also make your own sun-funnel solar cooker out of cardboard and aluminum foil to boil water! Check out the way they did it below. We often depend on survival tools that require batteries to run; and, in an SHTF this plan can go downhill when a spring breaks in your battery holder. If this happens, all hope is not lost – simply rub a small piece of aluminum foil into a ball and push it into the battery holder between the tip of the battery and the case. This should get your devices going in no time. You can also use this trick by placing the wrong batter size (such as AAA) in a AA battery slot. The aluminum foil will make up for the difference! 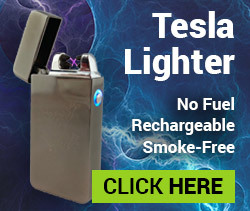 We really do depend on our electrical/battery-operated survival tools, and aluminum foil can really help you keep these running functionally. However, these are temporary solutions – after all, your batteries could easily die, and/or you could run out of your battery supply. Plus, one can only afford to carry so much aluminum foil in their bug out bag. If you aren’t prepared with other ways to use/charge your devices, you’re going to be in a world of trouble. Luckily, as you saw in the video in #22, we can use the power of the sun’s rays in order to cook our survival food, meaning you don’t need a crockpot or other electrical device to get the job done. 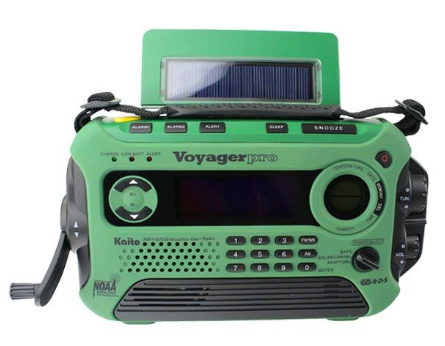 And, thanks to our impressive stock of solar-powered survival gear, you can now use the power of the sun’s rays to light your way, gain news and weather reports, and even charge your phone/other USB devices on the go. 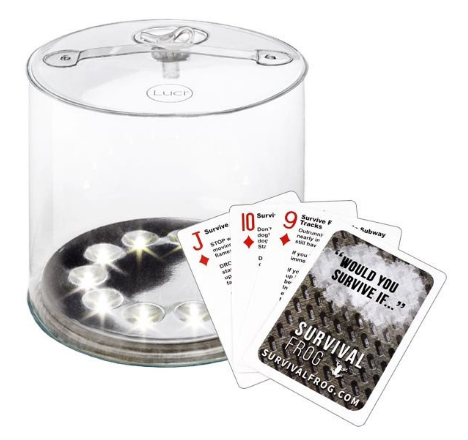 With these handy devices you’ll never have to worry about running out of batteries again; simply set these survival tools out in the sun, and they’ll be charged up and ready to go in a matter of hours. No batteries required! 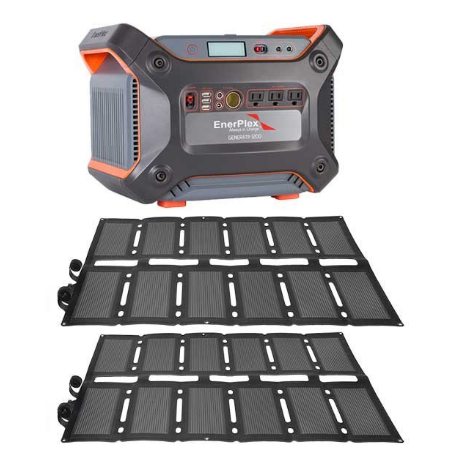 Plus, many of these solar-powered have the functionality of many different survival tools, making your load lighter and your packing smarter. 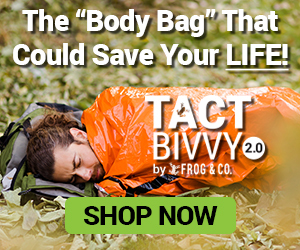 We here at Survival Frog want you to thrive in a crisis; and to thrive, you need to be prepared for any/every situation that can occur – which includes having dead batteries. 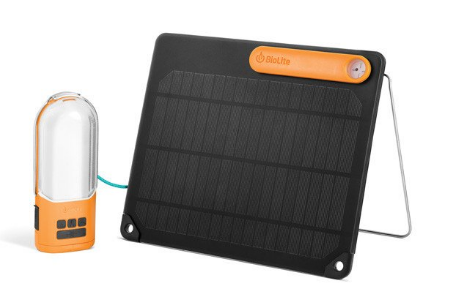 Come prepared by stocking up on the following solar-powered survival tools today. 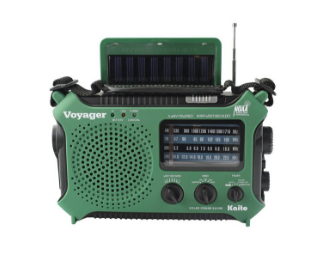 This entry was posted in Emergency Preparedness, Outdoor Survival, Prepping, SHTF, Survival Hacks, Videos and tagged bug out bag essentials, DIY Survival, diy survival tools, prepper hacks on January 18, 2017 by Survival Frog.